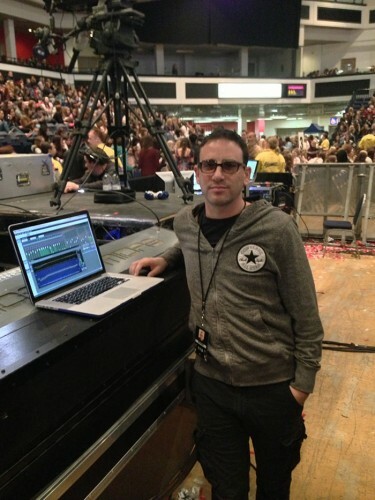 A compact FOH/monitor audio system, based around an iDR-32 iLive MixRack, is currently on the One Direction European arena tour with American popstar, Camryn, who is opening for the boy band on their sell-out 63-date tour. Camryn’s manager and sound mixer, Jeffrey Pringle, put together an efficient and compact system which consists of an iDR-32 MixRack brain fitted with a Dante network card and controlled by iLive Editor on a MacBook over WiFi. This provides 5 stereo in-ears mixes for the band, plus the main FOH mix. Latterly, Pringle has added a PL-10 remote controller as a failsafe against WiFi problems should they occur. "I chose iLive for my touring system because it is a rack-mounting console that can be set up and controlled on a portable computer without a surface. Inputs can be split into multiple channels and run in layers to mix FOH and Monitors, and even the smallest MixRack can handle 64 channels, giving me 32 faders on a FOH layer using VCAs and 32 on an in-ears layer," explains Pringle. There are no analogue inputs in the set up. Band vocal mics and guitars are on Shure ULX-D radios outputting Dante, and the Drums, Keys and Guitar sound modules and processing are done on Mini-Macs running Dante Virtual Soundcards housed off stage in the same rack as the iDR. The bass player only attended rehearsals, so there is a click track running on Ableton, while all other members play live, with time-code sync of all settings and FX. "I’ve got the whole show in one case. iLive’s design means I can fit the audio system into a 13 space rack, which includes my FOH console, monitor console, in-ear units and all of my inputs. What’s more, I’ve mixed over 160 shows using iLive Editor over WiFi, with only one drop-out!" Pringle says. In picture: Jeff Pringle in the Cardiff Motorpoint Arena with his FOH console!